Powers/Abilities: Able to fly. Other powers unknown. History: Rudi and his dog Struppi would seem to be normal, average, Austrian citizens. But in fact they are secretly the superheroes Superrudi and Superstruppi. 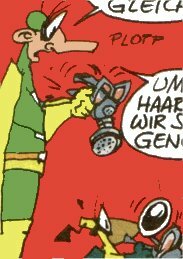 Comments: A pair of satirical newspaper daily strip superheroes who have been appearing in the Kronen Zeitung since 1998.